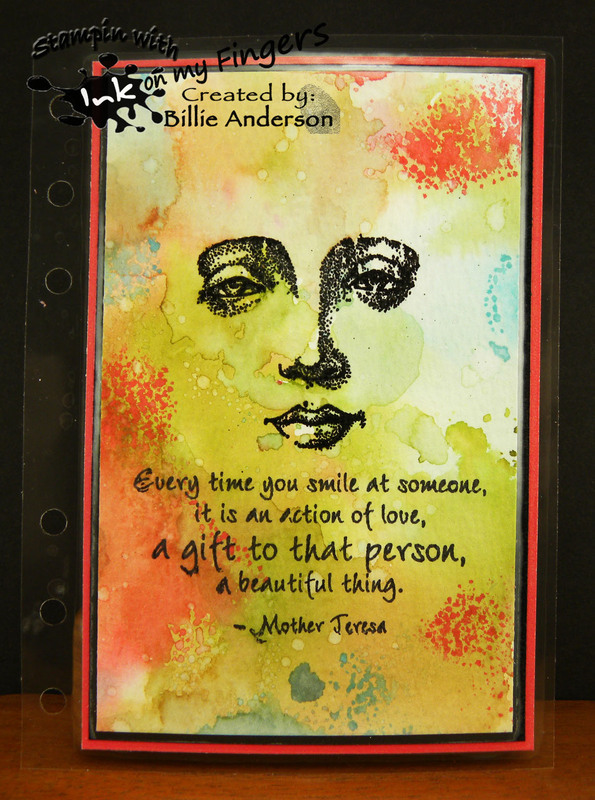 This is my card using the image called Dandelion Day.. 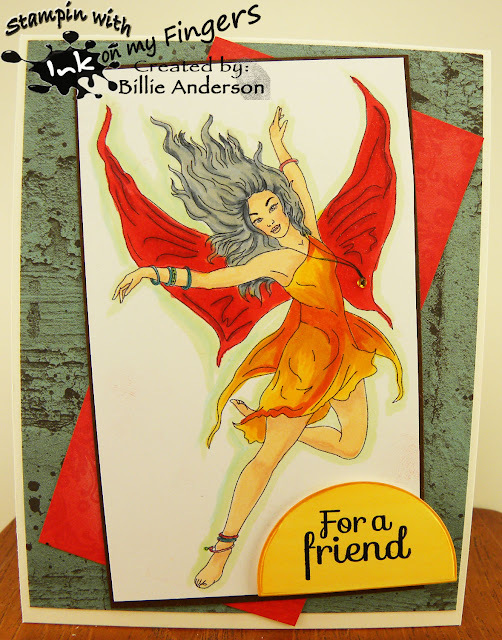 I was trying something new with the background by using the curve die. I wanted to stamp the sentiment inside the negative space but what I wanted to stamp was too big. So I ended up using some Tim Coffey letter stickers.. Make a wish because she has dandelions and sure she is about to blow the seeds and make a wish. I also thought it would be good for a birthday card. She is so cute and think this might go to my 12 year old granddaughter.. 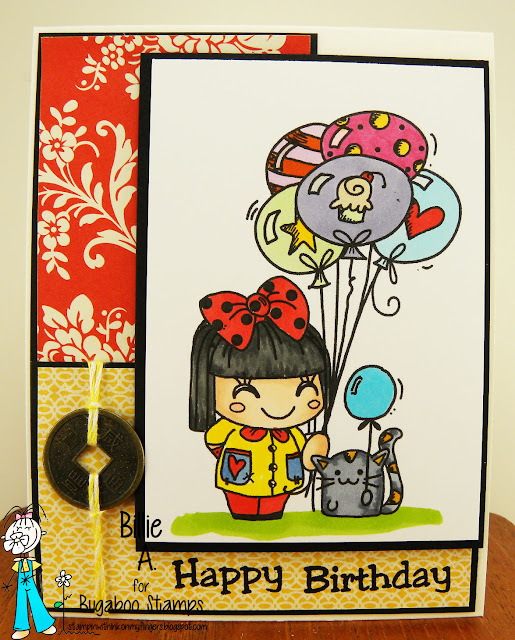 I hope you head over to Inspiration Destination and enter your ATG cards.. This is the darling NEW RELEASE image called Kid balloons.. I chose to give her an Asian look. I have this coin I got from Monika Reeck (who lives in Germany) her blog is Creative with Monika - thank you Monika. I used some scraps of designer papers that were laying around and gave me the Asian color and feel. I back them with black stampin up card stock. I colored her with copics. 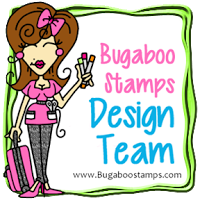 I hope you head over to Bugaboo and see the cute images in the store. And head to Catch the bug to see the DT creations with this image. recipe: image/bugaboo, scraps dp, su black, coin Monika, jelli bean twine, copics, sentiment? 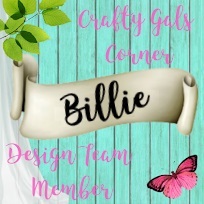 This is my card using the photo inspiration.. using the Bugaboo image spring bird I really did not know what to do so I printed off the bird image.. I then dug out my Tech. 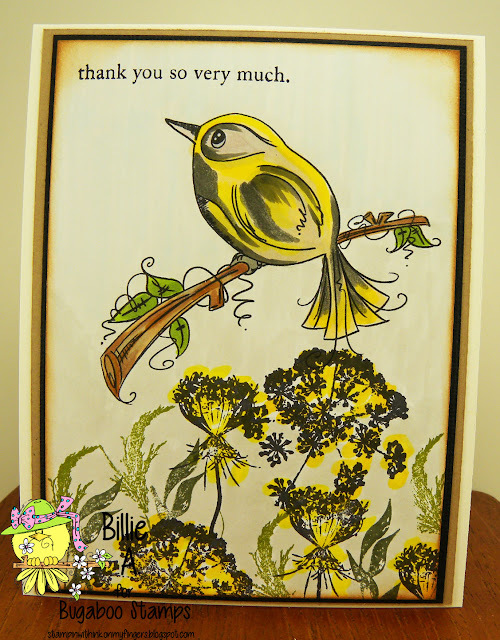 Tuesday stamps set and stamped the flowers /leaves below the bird.. I colored them really loosely and I did not like it so I put it aside for a day.. 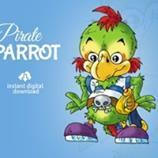 Still didn't like it but thought ok lets color the bird and see what happens.. Well I did and ended up liking it. It tied it together once the bird was colored. I lightly colored the background so it wasn't the harsh white and that helped tone it down. 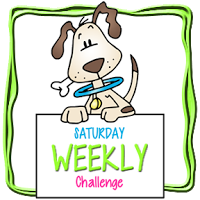 I hope you take time to make your card and enter it at the Catch the bug Saturday challenge. This is my cared using the image called Beauty Butterfly.. I really wanted to let the sentiment speak the words so I used my favorite designer paper Amy Tangerine and added the Free Friday image so it looks like the butterflies are with the flowers. 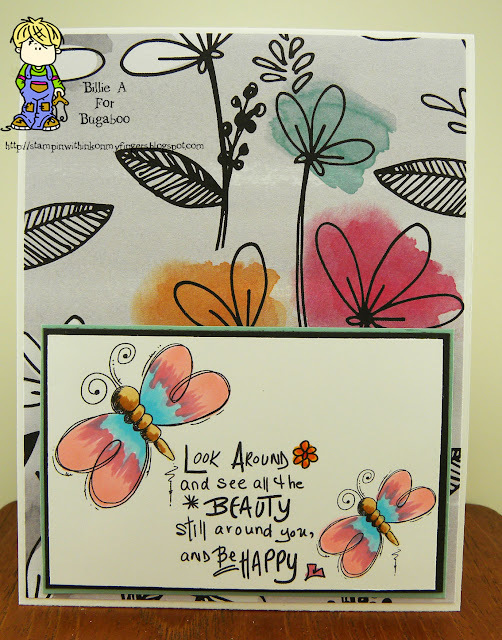 I love the sentiment that comes with the butterflies. I hope you head over to Bugaboo and get the image.. and look around the store and see what else is over there. 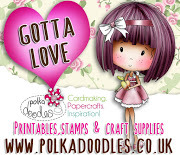 I love it when we sponsor ourselves.. On these days I will be using my rubber/acrylic stamps.. I just used this stamp for another challenge last week and because I love it and the sentiment I wanted to use I used it again.. and I decided to make a Journal inspiration page for my 2016 journal.. I used some watercolor paper and black embossed the face then I took three different color of ranger inks and smooched them on my craft sheet and spritzed with water and laid my paper in the mess.. dried it and did it again - dried it and did again till I got the effect I wanted. I then stamped the sentiment in black. I layered it on some black - pink and then laminated the whole piece and punched holes. 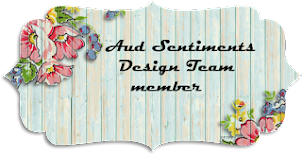 I hope you enjoy and I hope you find time to play along at Aud Sentiments.. you have two weeks to enter our challenges.. I chose to use the image called Meant to be.. I like this sentiment.. I think it would make for a great journal page.. hum.. I just might have to do that sometime.. I really wanted the flowers and sentiment to stand out so I used some soft stampin up designer papers and just colored the image.. I thought of coloring outside of the box image but then realized it would of meant doing the whole place outside not just beyond the swirl.. which I think would of taken away from the cute image and sentiment. I hope you play along at Inspiration Destination .. it's always ANYTHING GOES.. This is the image for our new release - Book sitter 2 - I sat him on a stack of book which is also a Bugaboo image. I used a couple sentiments from Tech. Tuesday and after stamping the sentiments I cut them apart to fit where I wanted them on the card front. For his levis I took an old pair of levis and cut out a 3X3 piece of cloth and used the Copic 0 and put some on the levi scrap and laid it on the pant leg of the boy. I colored the legs only first before I did this. You have to color first then do this technique to the area you want with the effect.. Then you can finish coloring all the other part of the image. I added glossy accents to his glasses to give a glass shine. 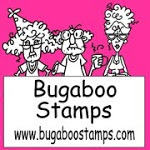 I hope you head over to the Bugaboo store and see the images Jodie has drawn. Also head over to the Catch the bug site and see what the DT did with this cute image. recipe: image/bugaboo, su green, echo park dp, embossing folder, su punch, eyelets, tech. 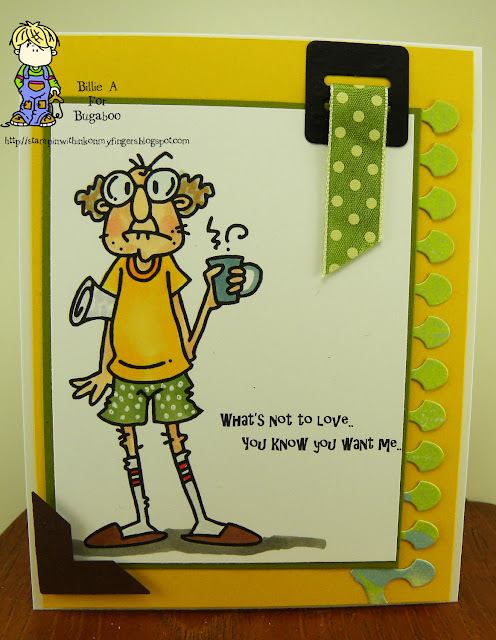 tues. sentiments, copics, glossy accents on his glasses, simon says curve die, levi tech. It's Friday and that means it's Free Friday at Bugaboo / Catch the bug. 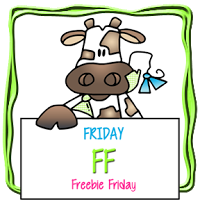 This is the cute free Friday image.. ML mim cute.. Little monster. I thought he looks like he's giving a hug so I added a hugs die cut and some hearts. This is perfect for that husband or even child. heck it's for anyone.. It's just how you make your card. I hope you find time to get over to Bugaboo and pick up this image and look at some other images.. Jodie does some awesome images. 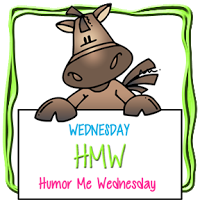 Welcome to Wednesday and over at Catch the bug it's Humor Wednesday..
May 18 is Buy a musical instrument day... so I have Johnny guitar with his new guitar... He's a rocker and has the rocker hair.. 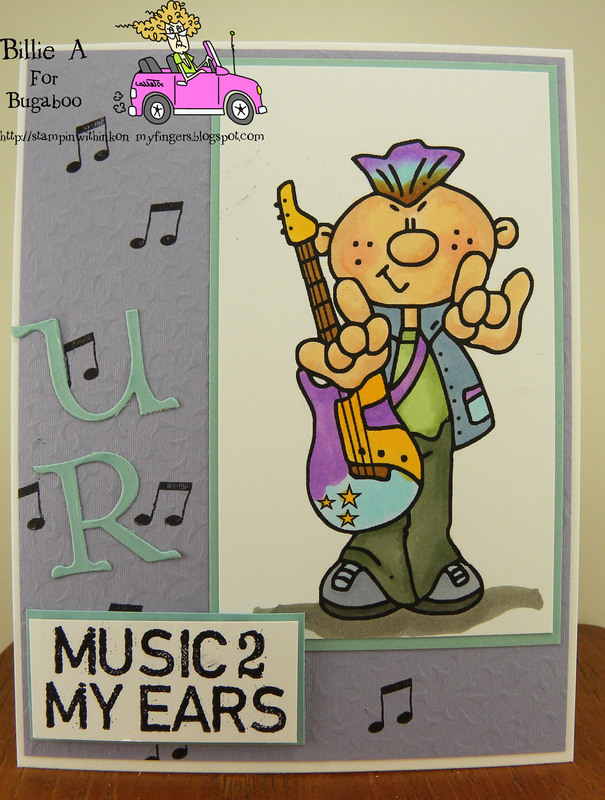 I gave him some fun colors and sure he's going to rock out a great song or two.. I think I was kind a going with the purple in honor of Prince.. yeah even at my age I loved a lot of him songs and have some on my phone that I listen to. Such a great loss and will be greatly missed. I hope you play along, we have a great sponsor. This is my card using the image Fire Fairy... I think after I am now posting I should of worked a little more on her hair and add some red to it.. I am still trying to figure out hair colors.. I do like the other colors I added and I used a mixture of colors for her dress so it's not all one color. Fabrika has some awesome images and I always like working with their images.. 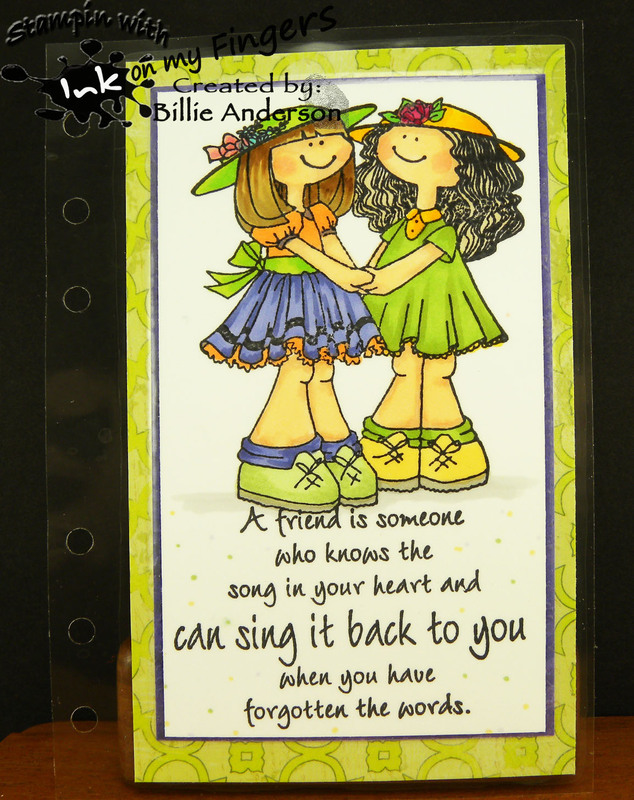 I did not know what sentiment to use so just chose a very simple For a friend.. 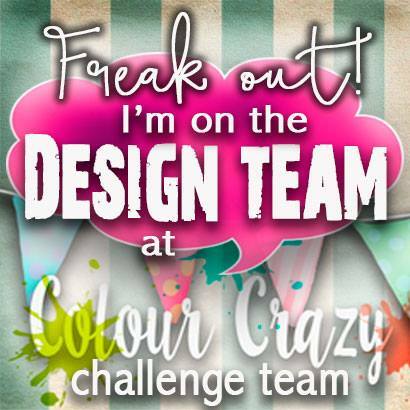 I hope you play along at Inspiration Destination.. we added some new DT members so take a look at their awesome works and play along.. Here is the awesome perfecting timing image called Sign it critters.. perfect for my great grandson's 8th birthday coming up on the 25th May.. I know the present is more important than the card at this age.. but I had fun making this cute card. 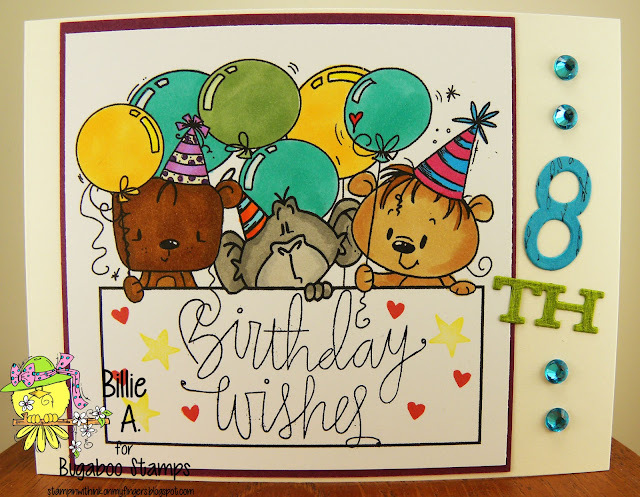 I used the birthday wishes from Simon says and the number 8 is from Taylored Expressions and the TH is from Paper Trey ink.. 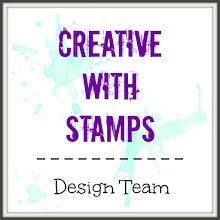 It's mid month reminder that we have a challenge at Creative with Stamps challenge #2 which started Ma 1st.. 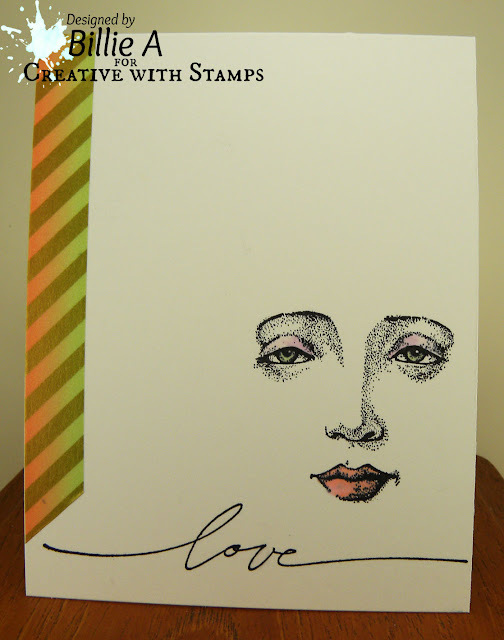 The theme is Clean and Simple.. You have a couple more week to get your card posted over at Creative with Stamps.. I hope you play along. This is my card for the mid-reminder post. 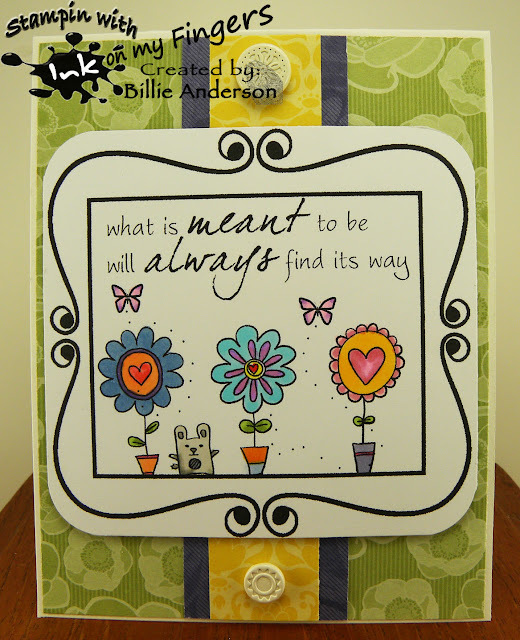 I used the image from Judi Kins and the sentiment is Stampin up.. The washi tape is from Simon Says.. I did use a little copic touch to the eyes and lips.. Quite CAS.. huh? It's Friday and we have another Free Friday image at Bugaboo / Catch the bug.. This image is Gus ..who is a favorite of mine. This is the card I made using Gus.. I added a sentiment of my own. I thought it was funny and what's not to love.. LOL.. I added white dots to his shorts with my gel pen. I carried it out with the white dots already on the ribbon. I had a few items on my desk and just used them, the buckle, corner cover and negative die cut. I hope it doesn't look like that.. I hope you find time to get over to the bugaboo store and pick up the free image and see some other awesome images. 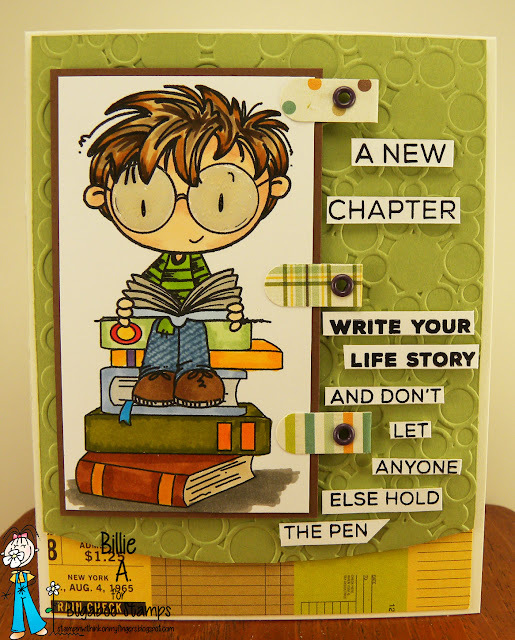 Again we are our own sponsor and so I chose to do another Journal page for my 2016 Journal. I am using the Eureka stamp .. I have so many Eureka wooden stamps and since I had this fun sentiment from Verse rubber stamps I thought this was perfect and it reminds me of my best friend Karen. She (we love green) so I colored her in the green dress and since we couldn't both be wearing green I chose purple, orange and green for my outfit.. those are some of my other favorite colors.. I layered it on some purple card stock and scrap of green then laminated the whole piece and punched my journal holes.. I hope you find time to play along. You have two weeks and it's anything goes plus a sentiment.